If you’ve been injured in a fall caused by a dangerous condition on property belonging to someone else, you may be able to recover money to compensate you for your financial and quality-of-life damages. 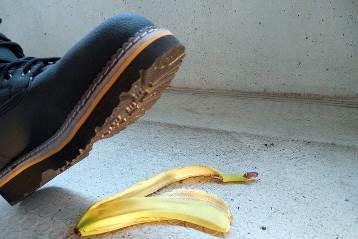 Slip, trip, and fall accidents are a type of premises liability case. They happen when a property owner, operator, maintenance contractor, or caretaker fails to maintain, inspect, or repair their property, allowing dangerous conditions to cause serious harm to a visitor or tenant. Although people of all ages are vulnerable to premises injuries, senior citizens tend to suffer the most serious injuries from falls, which often lead to dramatically reduced mobility, loss of independence, and diminished life expectancy. Anyone who owns, operates, or manages property has both a moral and legal responsibility to take reasonable care to keep it safe, to warn those who come onto the premises of any safety hazards on the property and to repair them as quickly as possible to avoid anyone being injured. When an accident occurs, the party at fault may be a property manager who is negligent in performing periodic safety checks of a store or office, or a building owner or government entity that allows a dangerous condition to exist in an area of the property accessible to the public. How Common Are Slip, Trip, and Fall Accidents? Slip and fall accidents send nearly nine million people to the emergency room each year. Falls cause brain damage, spinal cord injuries, serious fractures, organ damage, neck and back injuries, lacerations, scarring, sprains and strains, chronic pain, and death. Falls are the second leading cause of death in the home and in senior citizen communities. Falls cause around 25,000 fatalities every year, according to the National Safety Council (NSC). The U.S. Centers for Disease Control (CDC) reports that around 8,000,000 non-fatal fall injuries occur in the United States annually. CDC data show that falls are the number one cause of traumatic brain injury (TBI). Falls are the second most common cause of death on the job, after motor vehicle accidents. Workplace slip and fall accidents cause more than 300,000 injuries per year, or one every two minutes, on average. Traumatic brain injuries from falls are responsible for almost half of all fall-related fatalities among the elderly. Uneven and hazardous public walkways are the cause of nearly half of all slip, trip, and fall injuries. Falls happen frequently on walkways, driveways, ramps, stairs, ladders, in messy, cluttered areas, wet and slippery floors and pavement, and on uneven surfaces. Merchandise that has fallen from poorly-stacked shelves and spilled food in the aisles can also cause falls, and construction and other job sites are also common places for falls to occur. Failing to take these precautions can result in liability for injuries or wrongful deaths that result. Call for help and report the incident to the owner or manager of the property immediately. Write down the name of the property owner or manager and the person to whom you reported the accident. Note the exact time of your fall. Get contact information for anyone who witnessed the accident. Take photos with your cell phone camera, showing the condition that caused you to fall. Get medical help immediately. If necessary, have someone call an ambulance. Tell the doctor and ER personnel where you fell and how the fall occurred. Save your clothing or footwear worn at the time of the accident, without cleaning it. Contact a skilled Dallas-Fort Worth lawyer with experience handling premises liability cases. Do not give a recorded statement to an insurance adjuster or company representative and do not sign any medical authorizations, releases, or other documents unless your attorney instructs you to do so. If you have suffered an injury on someone’s property that you believe could have been avoided had you been properly warned of danger you should contact Samples Ames PLLC at (817) 605-1505 or (469) 466-2600 to determine if you can file a personal injury lawsuit under Texas’s premise liability laws. Property owners are required to ensure their premises are safe enough to enter without unreasonable danger of injury.